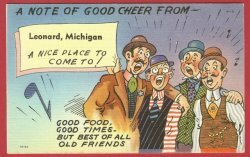 A note of Good Cheer from- Leonard, Michigan. A nice place to come to! Good food, good times, but best of all old friends. Postmark - None. Condition - Very good. Light corner wear.